I stopped by my Mom’s house on Sunday to deliver a quilt I just finished for her. This is a picture of my Mom on her front step holding BQ#1. This quilt was inspired by a quilt I saw at the Lynden Fair in August 2006. 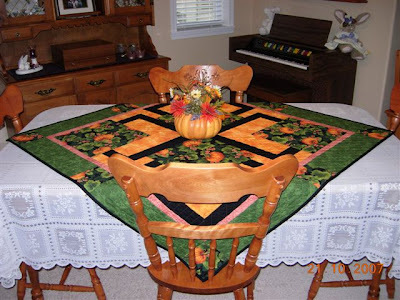 If you take a look at my post from August 16, 2006, you will see the quilt that inspired me to search for the pattern for this quilt. On September 18, 2006 I finished BQ#1 to the flimsy stage. I mentioned in my post on that date that I cut out two of these quilts at the same time–one to be finished for my mother and the other to be finished for myself. on the dinning room table) The other ones she made me last year. I am real proud of my Halloween / Fall assortment. These pictures are included here as well for your viewing pleasure. And finally, a picture of Jack smiling at you. 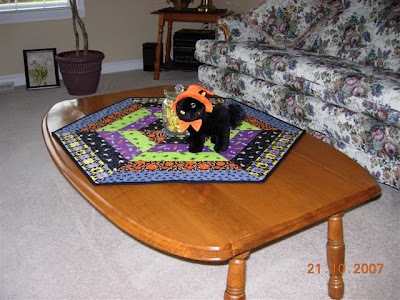 This entry was posted in BQ quilt, fall quilt, halloween quilt, hexagon quilt, mom's quilts, table runner by Norma Hanson. Bookmark the permalink. She looks so happy! 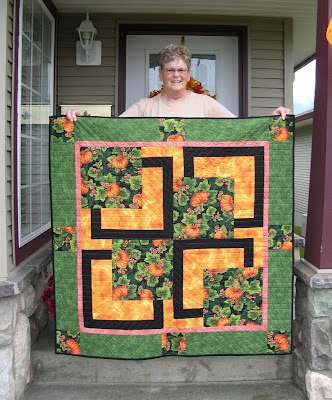 Her quilts are awesome….you’re so sweet. Your Mom is very lucky to have you. She has some beautiful quilts and decorations. What a nice smile you put on your mother’s face! 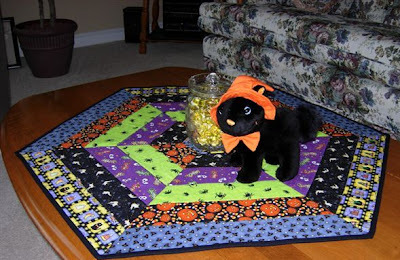 The quilt is great as are all of the decorations. Thanks for sharing. 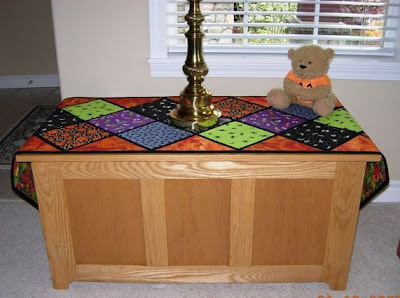 I love that table topper, as well as all the quilts. I am glad you have your mom to spoil a little!! What a charming display! I know your mom is just as proud of you as she is the seasonal items to put out. I don’t think you could have a bigger booster for your efforts, Norma. 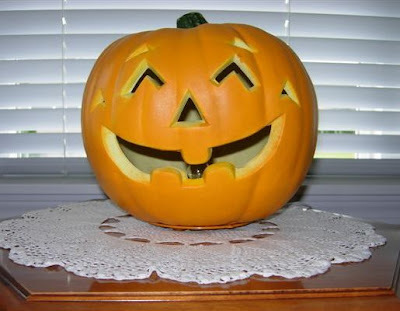 It appears Jack is chuckling about something Looking very festive at your house, Norma. You are in the fall/holiday spirit. Wonderful!